Welcome to the 2nd Quarter of the school year! KINDERGARTEN: Kindergarten spent their time in the computer lab this week using Bailey’s Book House and Jumpstart Kindergarten. 1ST GRADE: 1st Grade again worked on the How Tall is a First Grader project. We read the book Not So Tall for Six by Dianna Hutts Aston and talked about height. Then each 1st Grader was measured and they typed their height into an Excel Spreadsheet and watched the graph of their heights show on the screen. It will be interesting to see how our 1st Graders compare in height to the other 1st Graders participating in the project. 1st Grade also spent time using the educational software program Jumpstart 1st Grade. 2ND GRADE: 2nd Grade also used an educational software program, Jumpstart 2nd Grade, during the week. In addition, they recorded their comments about their Favorites of Fall for the Online Autumn Project. 3RD GRADE: 3rd Grade continued to work on their Life Cycle of Plants project in KidPix. As they finished these, they visited various web sites about the life cycle of plants. Most of the students have or will complete these next week and we will be sharing their slideshows online. 4TH GRADE: 4th Grade watched a short video on Presidential Elections, learned about the candidates for President and visited our Voting Booth and selected their choice for the next President/Vice President. They also completed their work on their All About Me projects and their Internet Safety posters. We will be sharing at least the Internet Safety posters online soon. 5TH GRADE: This was a catch up week for 5th Grade who spent their time working on their All About Me projects in KidPix and their Internet Safety videos, quizzes and posters. Most students have completed these and we will be sharing them very soon. Students that were finished with their work played math or spelling games at Tutpup. 6TH GRADE: 6th Grade practiced keyboarding and continued to work on the Cyber Bullying comics in Microsoft Word. Most students have finished these and we will be sharing them soon. 7TH & 8TH GRADE: This week was spent discussing the election and how the electoral college works. 7th and 8th Graders created an Excel Spreadsheet to count “electoral” votes from the school by assigning each class 1 electoral vote for each 5 students in the class. 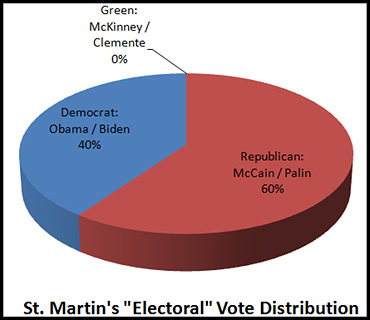 They discovered that while McCain had 50% of the popular vote at school using an electoral distribution he ended up with 60% of the electoral vote.